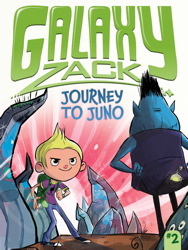 The series of six children’s books in Galaxy Zack are brand new, and intrigued me at first glance because the writing seemed accessible to early readers, especially boys. The publishers, Simon and Schuster, were kind enough to let me examine the first two in the series. After reading them, my first reaction was, “Oh, no way.” As you can see by the quote I selected above, there is very little magic or lyrical content to the writing. The language almost seems patronizing to an intelligent young reader. My first inclination was to ditch the books as not qualifying as great children’s literature. Indeed, I would stand with that assessment, but I learned something else about these books. I decided to try this children’s book out on the group of second grade boys that I am tutoring in reading. They are in a Waldorf charter school, exposed to very imaginative content. I wondered what their reaction would be. Much to my surprise, they loved this children’s book. What appealed to them was the space aspect of it, the possibility of reading about space travel to other planets. It was also appealing that for these emerging readers, many of the words were within their reach. Then I brought the same children’s book, (Hello, Nebulon) to a second grade student in a private school which is more oriented toward modern culture. His reaction was interesting: he definitely wanted to keep reading, but wasn’t sure it was great. When I asked why, he said there was not enough action happening. In fact, in my own assessment of the first children’s book in the series, Hello Nebulon has too little action. The second book, Journey to Juno, does at least have a conflict to be resolved. In many ways, the Galaxy Zack books have the same characteristic that I described in the Amber Brown review: it is too realistic. Yes, of course, Galazy Zack is set in the future, and has the science fiction aspect, but it is still about realism, what the daily life of a child looks like. In that respect, I am still a fan for more imagination, more inventive writing, and deeper issues in a good children’s book. But, the boys have clearly outvoted me in this one. A word of warning (and advice to the publisher): the use of unusual layout for words (some are diagonal, some are white on black pages) can be a big deterrent for any young readers with visual tracking issues. Given the age that these books are for, I would omit the fancy graphics when putting the text on the page, so that any child could successfully work with the book. Visit the Publisher’s Page for on-line activities.